For orders above catalog quantities, please contact your distributor for pricing and production time. Lighter Color: Choose from the selection shown. Imprint Area: 3/4" x 2 1/8"
Specify vertical or horizontal imprint position. 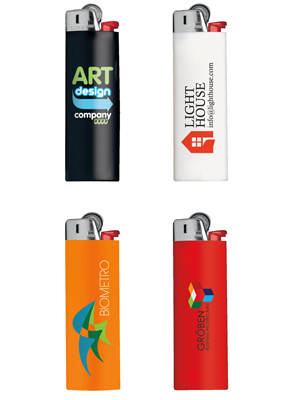 Lighters will be imprinted horizontally unless otherwise specified.1-color, 1-side imprint included. Up to 8 colors available. Add $.15 per lighter for each additional color in single location. Add $.15 per lighter for each additional color in second location. click here for imprint layout options. Custom color match, specify PMS number: Add $32 per color. Packaging: Standard - 17 lbs. (approx.) @ 300 per carton packed in 50-count trays/boxes. All lighter shipments are subject to hazardous materials surcharge by the carrier and cannot be shipped under the QUICK BIC PLUSSM shipment plan. This item is classified as a hazardous material by various federal agencies and may not be reshipped or mailed except in an approved container. Click here for special shipping information.